Urban myths of the late eighteenth century suggested that Tokugawa Ieyasu had been troubled by the constant recurrence of the name of one particular swordsmith among his enemies. Late in life, he developed a superstition that blades made by the sixteenth-century school of Muramasa had been specifically cursed to do damage to the Tokugawa family. The reasoning for this, at least as far as the rumours went, was that Ieyasu’s grandfather had been killed by one, his father had been stabbed by one, and Ieyasu injured himself with one when he was a child. His worries only increased when he discovered that in the case of two executions, that of his adulterous wife and supposedly treacherous adopted son, the executioner’s blade had been a Muramasa, too. Over time, Ieyasu came to believe that every one of the generals who had opposed him had wielded a Muramasa blade, including Sanada Yukimura, who had supposedly dealt him a troublesome wound at the Battle of Tennōji in 1615. The attentive reader may note that sources from the time report that, if Ieyasu was wounded at all by Sanada, he was wounded with a spear, but no matter – the fiction was already more alluring than the already shaky facts. Muramasa blades were highly prized, so it should have come as no surprise that they were in the possession of wealthy members of the aristocracy. Nor should it have been a mystery why aristocrats facing death would insist on their executioner using the sharpest, highest-performance blade available. 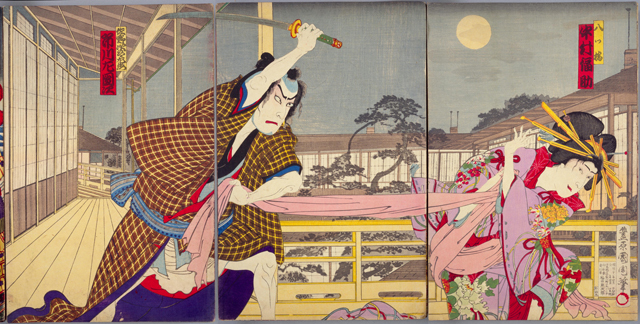 But the stories about the ‘Curse of the Muramasa’ seem to have served another purpose in eighteenth-century Japan: delivering a chilling frisson to audiences with the reminder that there was a time when someone stood against the Shōgun, and that their legacy lived on, hidden within clans, buried in storehouses, and traded among sword-dealers. Trembling, he withdrew it from its scabbard, and he forgot to breathe. The sword had hidden depths, like morning mist welling up within the metal. Light danced off the blade in the colours of the rainbow . . . Just by holding it in his hand, he could tell it was a masterpiece . . . an artefact suitable for a lord’s treasure house, fated never to come into the hands of a common samurai. The samurai is even happier when the dealer offers to sell him the blade for a fraction of its true value, although he will not say why. Cheerfully, Gentaro brings the sword back with him to his home domain, where he shows it off to his fellow officers at the monthly sword club. Despite everyone’s gasps of awe, the club chairman tells him the sword is worthless. Suspecting that the chairman merely wants to buy it from him cheaply, Gentaro seeks a second opinion, and is told the whole sorry story of the cursed blades. In a spate of demises that prefigure the calamities of a modern horror film, most people involved in the story are dead within a week, as is the family servant told to throw the sword in a river, who unwisely plans to keep it for himself. The legend achieved a wider audience in 1797 when it gained a prominent mention in a popular kabuki play Oblique Reflections of Brothel Lives (Satokotoba Awasekagami). Revived in 1815 and again in 1860 with slight variations, the story became a recurring staple of the Japanese theatre. The main narrative concerned a missing girl in the pleasure quarter, and an impoverished son of a merchant desperate to raise the money to buy his lover out of indentured servitude in a brothel. Mixed in with these basic plots are shadows of the Muramasa legend – a cursed Muramasa blade is sold by a hapless sword-dealer, who is soon murdered; it falls into the hands of one of the leading characters, and drives him into a serial-killing spree. As so often happened with kabuki theatre, real-world reportage is hidden within the melodrama. It drew inspirations from the collapse of an Edo bridge in 1807, and the 1820 murder of a capricious geisha by the man who had bankrupted himself to buy her freedom. By the nineteenth century, Muramasa swords were associated with a whole series of half-remembered macabre tales of murder and betrayal, and had come to be linked in the popular mind with the decline of samurai honour into bloody, inconsequential vendettas, and fights over bar-girls or petty debts. Despite the superior quality of Muramasa blades, they became impossible to sell, and there are cases of some swords on which the smith’s name was doctored, Muramasa becoming altered to Masamune – another smith but without a tainted reputation. In fact, the anti-Tokugawa reputation of the Muramasa blades gave them an unexpected value among those who despised the government. Those few that survived the Tokugawa era, hidden in family vaults, are now worth millions. Extract from A Brief History of the Samurai, by Jonathan Clements.